Greater Boston PSR (GBPSR) and International Physicians for the Prevention of Nuclear War (IPPNW) are honored to have again been selected as Community Partners for the 2019 season of the Longwood Symphony Orchestra’s (LSO) Healing Art of Music™ program. As Community Partners, we will be featured during an evening LSO concert at 8:00 PM on Saturday, October 5th, 2019 at New England Conservatory’s Jordan Hall in Boston, with proceeds benefiting our organizations’ efforts to prevent nuclear war. The concert, as well as an exclusive reception and presentation beforehand at 5:30 PM in the NEC’s Williams Hall, will feature atomic bomb survivor and renowned anti-nuclear weapons activist Setsuko Thurlow, a leader of the International Campaign to Abolish Nuclear Weapons (ICAN) who accepted the 2017 Nobel Peace Prize in Oslo on behalf of her colleagues. Please support a sponsorship for this inspiring musical and educational event if you can. As a sponsor, you will have advertising opportunities and be prominently featured to an audience of approximately 1,100 people, including healthcare and business leaders. To support a sponsorship, please fill out the form below and we will contact you. The reception will begin at 5:30pm at Williams Hall, which is located in the New England Conservatory (30 Gainsborough St, Boston, MA 02115). The reception will be “business casual” and will include food and drinks. The concert will begin at 8:00pm at Jordan Hall (also located in the New England Conservatory). 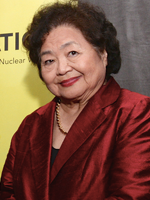 Ms. Setsuko Thurlow was 13 years old when she witnessed the atomic bombing of Hiroshima on August 6, 1945. Nine members of her family and close relatives, and many of her classmates, were among the 70,000 who were killed within the first minute. Three days later, Nagasaki was destroyed by a second atomic weapon. By the end of 1945, the bombings killed more than a quarter of a million people. Setsuko has spent the last 65 years speaking out about the horrors of nuclear war in an effort to ensure that nuclear weapons are never used again. She is one of the remaining Hibakusha—the survivors of the atomic explosions—who bear witness to the catastrophic humanitarian impacts of nuclear weapons. Through their personal stories and great courage, the Hibakusha have inspired generations of people around the world to take action, helping to pressure governments to ban and eliminate nuclear weapons. Setsuko became an early advocate in the International Campaign to Abolish Nuclear Weapons (ICAN), which IPPNW founded in 2007. Her powerful testimony played a critical role in the campaign’s successful effort to persuade United Nations Member States to negotiate and approve the landmark Treaty of the Prohibition of Nuclear Weapons in 2017. Later that year, Setsuko joined ICAN executive director Beatrice Finn in accepting the Nobel Peace Prize on behalf of ICAN. With an academic background in sociology and social work, Setsuko also spent her career in service to others at numerous educational, medical, and social service organizations, including the founding of Japanese Family Services. Her work has been recognized with many awards and distinctions, including the Order of Canada and the Queen Elizabeth II Diamond Jubilee Award.